Image's Saga Vol. 8 trade paperback, the top graphic novel for December, was both the top reordered softcover for the third week in a row and also the top reordered item overall by dollars. 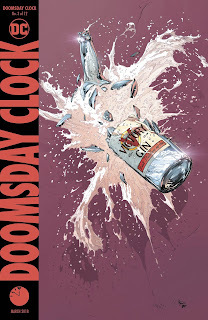 The top reordered comic book was DC's Doomsday Clock #3, which went on sale January 24. It had previously led the advance reorder charts. The top reordered hardcover was DC's Superman: Golden Age Omnibus Vol. 5, which went on sale January 24. As with last week, it was another week in which the advance reorder chart was mostly dominated by comic books. 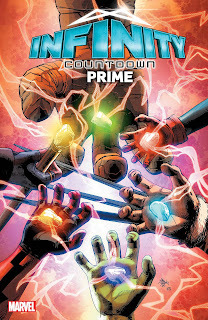 Topping the list overall was Marvel's Infinity Countdown Prime #1, a $4.99 issue which is set to go on sale February 21. A Logan variant of the issue was the #2 advance reordered comic; a trading-card variant also made the list. Dark Nights Metal #6 was the top advance-reordered March comic book. Gone finally from the list was Oblivion Song by Kirkman and De Felici Collector's Edition, a recent fixture. The Action Comics #1000: 80 Years of Superman book repeated in the top hardcover slot; it's been first among hardcovers four out of five weeks. It's an April 11 title. For the third week in a row, there weren't any trade paperbacks in the Top 25 at all.